Who else goes to target for toothpaste and ends up buying the entire home decor aisle? *slowly half-raises my hand* Target is such a great place for affordable home decor finds. 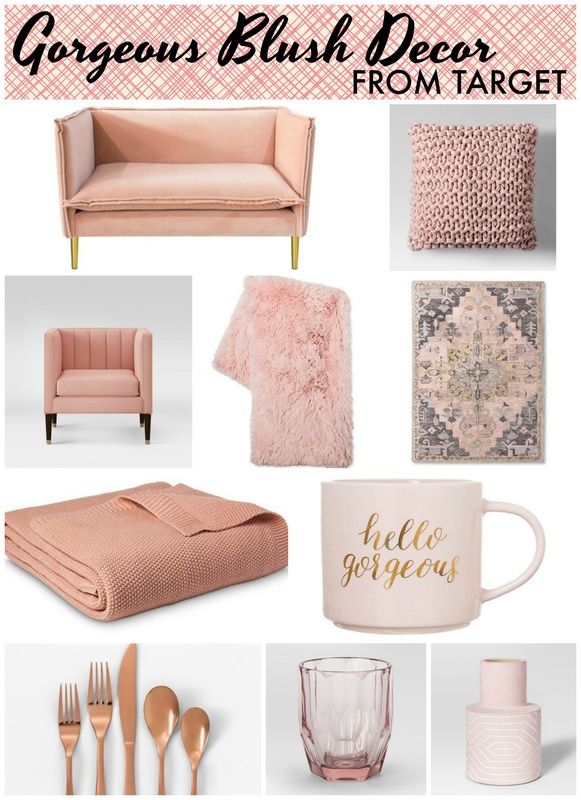 These are the most gorgeous blush colored items that they have to offer for fall 2017! Scroll through below to see all of the amazing hints of blush you could add to your home! Project 62 Earthenware Vase with White Etching Medium – Blush • $14.99 – I’m picturing this vase holding some white branches or something like that. Project 62 Round Woven Basket • $19.99–29.99 – This basket would great for holding blankets or to hold a cute potted palm plant. Project 62 Double Old-Fashioned Mountain Glass 10.5oz – Rose • $4.99 – This cute pink glass would liven up any bar cart or dining table too! Plus, it’s only $5- c’mon!! If you can’t get your hands on these items today, you might as well pin the below image to your home inspiration board on Pinterest, right?